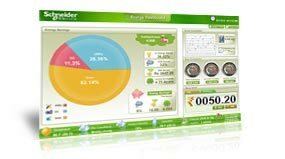 Schneider wanted to build a very attractive Energy Dashboard to monitor the resource utilization and energy savings for Delta Electronics, India's Platinum rated Green Building by making use of Microsoft Silverlight technology. The challenge was to design a very good looking and functional Energy Dashboard and the same should integrate with Schneider's Building Automation System in a very short time. The Energy Dashboard was to display Energy Utilization Breakup, Energy Consumption, Water Consumption, Solar Power Generated and the Monetary Savings for the implemented environment. SIERRA with wide experience in building Microsoft Silverlight based applications took the challenge and completed the delivery as per schedule. The successful, quick and impressive work by SIERRA team, gave us the opportunity for our CEO to meet-up with Schneider team from Australia to showcase SIERRA capabilities for winning future projects with Schneider, Australia.